Sonic Forces is a fever dream of fan-fiction that is awkward to play but still manages to be trashy fun. Set in a grim future where Sonic has been defeated by Doctor Robotnik and his mysterious new henchman Infinite, Sonic Forces follows the series’ cast of heroic animals as they fight a dire war to win back their world. The story is dripping with self-serious intensity, portraying a dark future of robo-oppression and torture. At first, it seems that Sonic Forces is trying too hard to be edgy. Sonic’s aesthetics usually hover between pinata party and ecstasy-fueled furry fan festival but Forces initially depicts a game world of ruined cities and fire. It’s jarring, particularly when the world is still populated by animal pals. But as the game progresses, Sonic Forces’ narrative presses forward with an earnestness that softens any edge into campy pulp. There are giant snake battles, dimensional rifts, mugging villains, and heartfelt speeches about the power of friendship. It’s stupid, as if someone took every piece of Sonic fan fiction and tossed it into a blender, but there’s fun to be had in the absurdity. The game’s most notable feature rests within a simple narrative conceit: what if players could create their own anthropomorphic animal friend to participate in the fan service? 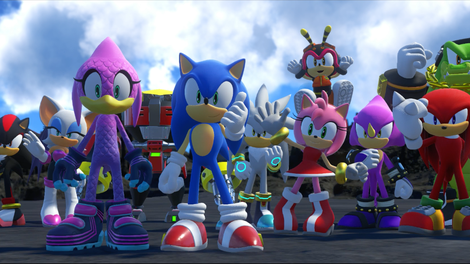 Sonic Forces allows players to make their own avatar from a small group of animals (wolf, rabbit, cat, dog, bear, bird, and hedgehog) and toss them into the story as a new recruit to the animal resistance. Each of these animal types have minor gameplay benefits. Birds can double jump. Bears have a homing attack. These abilities are secondary to the fun of creating an original character and playing dress up. As the game progresses, more and more outfits are unlocked. The furry resistance fighter can go from wearing a Metal Gear style sneaking suit to a colorful dress to a trippy tie dye ensemble. It’s also silly, but the avatar’s inclusion generates a lot of charm. It’s neat seeing your bird girl fight baddies side by side with Sonic and friends. I made a bird girl. She’s just happy to be here. Sonic Forces struggles with its gameplay. Levels are divided into three potential types: an “avatar” stage starring players’ custom characters, Modern Sonic stages that emulate later 3D games like Sonic Generations or Sonic Unleashed, and Classic Sonic games featuring the 2D perspective of the original Sega Genesis games. Shifting from character to character and juggling playstyles should imbue the game with variety and energy but each level type has big/notable problems. "It's my original character Blonic!" Fun character customization, goofy plot, and a great sense of speed. Level design leaves a lot to be desired, uninspired boss battles. It has a lot of fun ideas but never pulls them off well. Completed the main campaign in about four hours. Modern Sonic levels are flashy and the most fun but are also shallow. They’re basically long corridors packed with loops and twists through open space and bizarre architecture. Modern Sonic zips along the sides of skyscraper, leaps between grind-rails, and even runs around cylindrical spaces evocative of Sonic Lost World. An extra boost function blasts Sonic to speeds fast enough to launch over gaps and ram through enemies. These levels provide a great sense of speed but are style over substance. Often, the game wrests control from the player and sends them down pathways automatically. These moments are visually dynamic but it amounts to watching a game on autopilot. Modern Sonic levels are like a roller coaster: there’s spectacle to be had and wondrous sights to take in but everything is ultimately locked on a rail. Classic Sonic stages double down on platforming, slowing the pace with more deliberately crafted but plain stages. The tried and true gameplay acquits itself well as Classic Sonic hops and spin-dashes with a welcome familiarity. Unfortunately, his levels are remarkably straightforward. Sonic Forces has the misfortune of releasing after August’s astounding Sonic Mania, which had some of the best level design in series history. That game offered an imaginative blend of movie sets, western worlds, and mixtape shuffles of classic stages. Sonic Forces’ 2D stages are more direct and while Classic Sonic’s movement is satisfying, the world he navigates is a bit dull. In spite of these failings, Sonic Forces drives players forward with an incredibly fast pace and some breakout set pieces. Most levels last slightly over one minute regardless of which character you are playing as. The result is an experience that feels purposeful and tense. It punctuates itself with some stellar moments such as a journey through a reality-warped city with shifting geometry, a trippy blast through abstract “void space,” and race to outrun a deadly laser beam in a feverish sequence of wall jumps and ziplines. These moments incorporate cheesy but catchy rock tunes to create memorable sequences of high action adventure. Sonic Forces is messy. The story is a jumble of references and nearly incoherent plot points while the level design is scattered and frequently undermined by conceptual flaws. Messy games just aren’t always the worst. This game plays out with so much infectious energy and excitement that it’s hard not to smile while playing it. 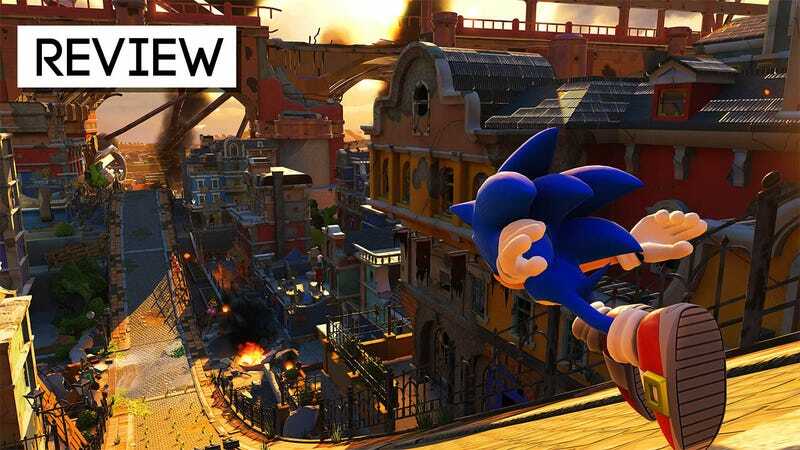 It’s not very polished but Sonic Forces manages to find excitement in spite of rough edges. It’s a playable Saturday morning cartoon: silly, janky but for a brief period of time, a fun distraction.